Vincent’s then-new KP screw press was first shown at the 1996 World Dairy Exhibition in Madison, Wisconsin. Rather than a sales effort, the objective of Vincent’s booth, was to determine the marketability of the product and to find suitable channels of distribution. Vincent knew that dairy farmers, especially large-scale operations, had been processing their manure through screw presses. With 68,000 attendees, the show gave them ample opportunity to find out why. Keeping bedding and manure out of the treatment pond extends lagoon life, this reduces the frequency necessary to dredge the lagoon. This cost deferral is a financial benefit. Environmental regulators are also a driving force, by keeping the fibrous solids out of the lagoon, odor generation is significantly reduced. Also, by pressing the manure ahead of the waste lagoon, a farmer can extend the capacity of existing lagoons. This avoids a number of permitting difficulties. 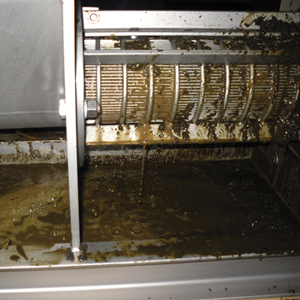 Pressing the manure separates it into two flows: dirty liquid and damp fibrous solids. Weather permitting, the liquid can be drained to the waste lagoon, or it can be pumped for irrigation purposes. Full strength manure is too thick to pump very far, and it plugs irrigation spray nozzles and cakes the soil. The manure solids from the screw press are composted for approximately ten days. This produces a rich fertilizer that is excellent for land spreading or tilling into a field. Some dairy farmers are selling this compost in bulk to nurseries and municipalities, while others are bagging the material for retail sale to home gardeners. One increasingly common use of the compost is as bedding for dairy barns. The farmers Vincent interviewed were using materials such as sand, sawdust, and rice hulls, which go either on the concrete floor or over a foam pad (In fact, there were at least four exhibitors showing rubber or plastic “cow mattresses”). University studies have shown that pressed manure has just the right moisture content (70%) for composting. This raises the manure temperature sufficiently to kill bacteria, thus making the compost safe for use as bedding. However, most of the farmers Vincent talked to were reluctant to use the material for fear of infection (principally mastitis) spreading to the herd (Since this original writing, it has become common to bed with manure solids straight from the screw press, without composting). The KP-10 press underwent a test at the University of Wisconsin and found that it will handle 50 gpm of manure and bedding, with only milking parlor water being added. The press achieves a separation of 43 gpm of liquid. The inbound solids split evenly, with 50% in the press liquid and 50% in the press cake (this split is low because of the dissolved solids in the manure; a screw press cannot capture dissolved solids). Press cake moisture content measures 72%. They process all the manure and bedding from 500-confined head in three hours and quarter each day.